Infinix Powerbank with 10400 mAh capacity now in the Philippines. Get it in Lazada. Before the imminent release of the Infinix Hot Note in the country, the Hong Kong-based company drops their popular Infinix Powerbank in the Philippines' biggest e-commerce platform, Lazada. The powerbank is rated with 10400 mah capacity which could approximately store four times the power of a regular smarthpone. Infinix claims that the device comes with a fast charging capability with its 2.1A output current. This also means that it could charge an iPad - unlike other powerbanks which settles with only 1.5A output current. Design-wise, the Infinix Powerbank features a luxury aluminum textured surface. There are 2 USD ports and an LED torch in case you'll need a mobile flashlight. 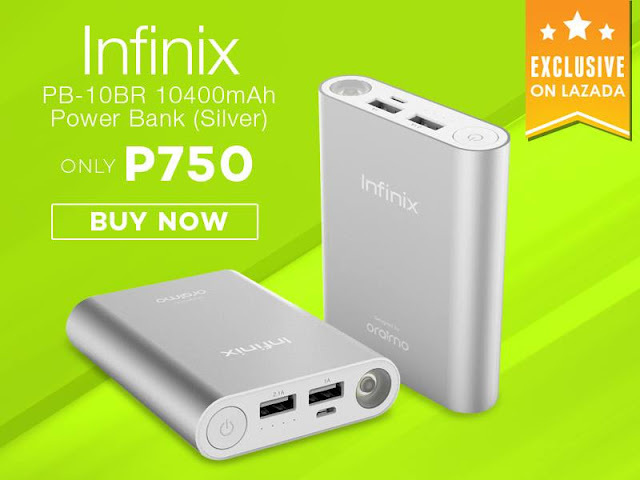 You can get the Infinix Powerbank with 10400 mAh capacity in Lazada for only Php 750.